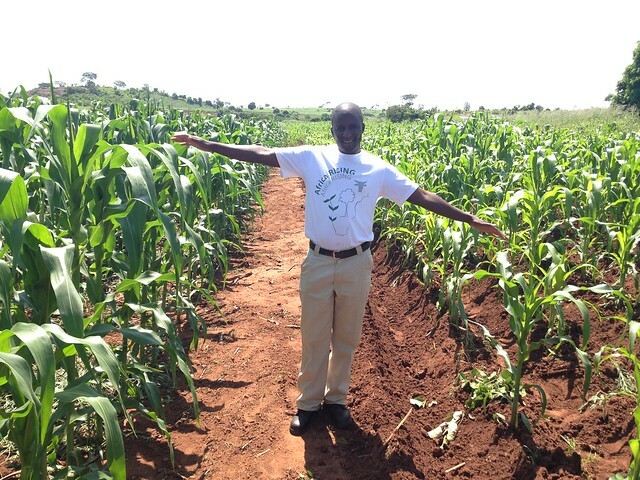 Mulundu Mwila, ZARI, standing in front of Gertrude Banda’s trial and showing the performance of conservation agriculture and conventional ridge tillage. Photo credit:Christian Thierfelder/CIMMYT. Conservation agriculture (CA) is a crop management system based on three principles: 1) minimum soil movement (i.e., no soil inversion by tillage); 2) soil surface cover with crop residues and/or living plants; and 3) diversification through crop rotation and intercropping. Besides these three main principles, CA depends on good agricultural practices (e.g., adequate fertilization, weed control, timely planting, and improved varieties) to show its greatest benefits. Most crops can be grown successfully under CA in Africa and there are large areas of maize, cowpea, soybean, groundnut, cotton, sunflower, and many other crops grown under this system. Even root crops, including potato and cassava, can be successfully produced under CA. Unlike in other parts of the world where CA has been successfully extended, its adoption has been largely focused on smallholder farms in Africa with the exception of South Africa, where it is practiced on large-scale commercial farms. Conservation agriculture systems have been successfully tried and tested in eastern Zambia since 2011. More than 20,000 farmers have been exposed to CA by SIMLEZA-Africa RISING, the predecessor project of Africa RISING, which continues to sensitize and train more farmers. Farmers benefitted from increased use of CA technologies by gradually increasing crop yields leading to a solid yield benefit of 117% (1942 kg/ha) in a manually direct seeded maize crop following cowpea as compared with the conventional practice in the 2014/2015 cropping season. Rip-line seeding led to a 109% yield benefit (1993 kg/ha) as compared to the conventionally tilled practice. It is the years with seasonal dry-spells and erratic rainfall, such as this last El Niño year, where CA provides its greatest benefits to smallholder farming systems. Large out-scaling of CA and its components is currently happening through mother-and-baby trials in Chipata, Lundazi, and Sinda and compliment other out-scaling initiatives implemented by the Catholic Relief Services and the Conservation Farming Unit in the Zambian Ministry of Agriculture. The principles of CA appear to have extremely wide adaptation, and CA systems are currently used by farmers under a wide range of environmental conditions. CA has been tried and tested in areas of sub-Saharan Africa that have above 500 mm of annual rainfall to more than 1500 mm of rainfall, from sandy to loamy clay soils and on altitudes from sea level to more than 3000 masl. Nevertheless, the techniques to apply these principles depend on climate, soil, and farmer circumstances (wealth, land size, traction owned, labor availability etc.). CA does not work well under waterlogged and very arid conditions or on completely degraded soils. Combined with good crop management and improved agronomic practices, CA can deliver a range of short-term and longer term benefits to farmers, which increase crop productivity and contribute to a sustainable environment and natural resource management in the medium to long term. The aforementioned benefits of rotations help control pests and diseases as well as “fertilize” the following crop, while minimum soil disturbance and crop residue retention reduce soil erosion and runoff, increase water infiltration, and improve some physical, chemical, and biological properties of soils. Yield benefits can typically be achieved in 2-5 cropping seasons, especially in drought-prone, rain-fed areas. Studies in Malawi have shown that appreciably high net returns can be attained due to reduced farm labour for planting (approximately 25-31 labor days/ha) and for weeding (another 12-15 days/ha). Combined with increased productivity this contributes to an extra net benefit of between 173 and 658 USD/ha in CA cropping systems compared with the conventional ridge and furrow systems. Other studies have shown that the adoption of a combination of CA-based practices, as opposed to single interventions, contributes to greater productivity, food security, and resilience in maize-based systems in Eastern and Southern Africa. Successful examples of its widespread adoption already exist from Malawi, Zimbabwe, and Zambia. However, there is a range of technological challenges to successful CA implementation that require adaptation to farmer circumstances. These challenges include: a) the need to retain sufficient crop residues, which can be difficult in intensive crop-livestock systems; b) weed control in the initial years of conversion to CA – if no herbicides are used; c) the availability of critical inputs and machinery; d) the need for profitable crop rotations; and e) knowledge and capacity of farmers and extension agents to apply the principles of CA in the correct way and at a certain standard. Successful adoption of CA systems often hinge on the presence of some key enabling factors. Where labor is a major constraint, farmers easily adopt labor saving planting techniques and weed control practices. Improved planting implements such as planting with a pointed stick, in rip-lines, or using herbicides for weed control made the technology move very fast. CA has also been adopted in areas were in-seasonal droughts or dry-spells affect general crop production and water saving systems can determine if farmers can produce a crop or not. Strong extension support in the initial years through participatory adaptation, farmer-to-farmer exchange, study tours, and field days have helped farmers understand the technology and facilitated faster uptake. Finally, markets and the demand for specific crops have made CA and its inter- or rotational crops have led to more rapid spread of CA technologies.